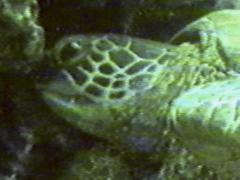 Here is a (poor) videotape long shot of 1991 Turtle 1 from 1991. Even though the angle has distorted the pattern somewhat, you can still easily see the Y pattern formed around the small triangle. Notice the small white spot in the upper corner of the eye, which becomes the size of a golf ball by 1994.